Sometimes – even plastic – when it rains! .We left the hotel, walked past the Ayunamento, over the bridge and out through the suburbs of Ponferrada, the first of which was Compostilla, a lovely area with neatly spaced house blocks with large luxury houses. We passed a modern neo-Romanesque church with a statue of the Virgin and Child sitting on a rock in front. The modern frescoes on the verandah walls were fascinating. We reached Camponaraya, a town with a seemingly endless main road. At the end of town is the Co-operativa Vinas del Bierzo, evidence of the area’s large wine industry. Further on more vineyards with branches draped on the ground. It must make picking the grapes difficult. Then to Cacabellos. At the far end of town next to the bridge over the Rio Cua was an antique wooden olive press. On the opposite bank was the Santuario de la Quinta Angustia, the church which had an unusual altar showing the baby Jesus playing cards with San Antonio de Padua. Darn, it was closed. Wet day. Slushy paths. By now, we were all thankful and pleased that we had the right wet weather gear. It had rained almost every day, and sometimes for more than an hour at a time. So what did we wear? Firstly no cotton clothing, as it holds moisture (perspiration) and takes a long time to dry. The principle of layered clothing: close to the skin – a T shirt or shirt, mostly synthetic, can have a little wool or cotton for smoothness; shorts or travel trousers. Layer two can be a vest or shirt. Then an outer shell jacket made from a breathable material such as Goretex. Same for the overpants. Also a broad brimmed goretex hat for the sun and the rain.It all worked well. After reaching Pieros, the map showed an alternative path via Valtuille de Arriba, but we decided to stick to the shorter main path. A particularly muddy road ahead. Our walk today brought us to the foot of a mountain range. When we finally approached Villafranca del Bierzo, the sun re-appeared causing mists to rise from the damp earth after the earlier rains. It was a magical moment. We made our way past the municipal refugio to the Church of Santiago and its Puerta del Perdon. This was the second Door of Forgiveness on the Camino. There would be no more of these ‘Doors of Forgiveness’ until we reached Santiago. We took our photos here, and viewed the sparse interior of the church. It was fortunate that we finished our business here first, as our hotel was all the way downhill at the other end of town. No-one apart from Nenad was likely to venture out sight-seeing once we had collapsed into the shelter of our hotel rooms. We passed the Castillo de los Marqueses de Villafranca and followed the Calle Agua all the way down to the bridge over the River Burbia and into Casa Mendez. 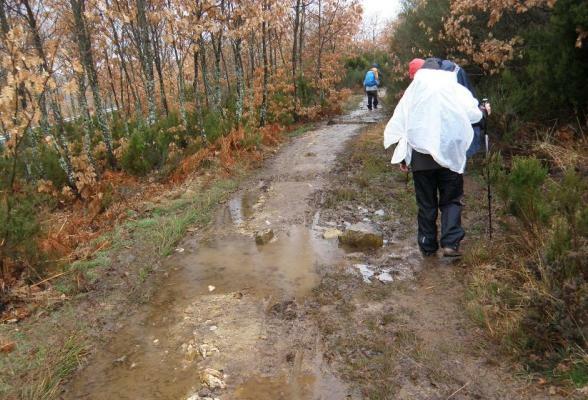 We had walked another day towards Compostela.